As a child Diepenbrock regularly visited the home of the Alberdingk Thijm family. The literary scholar J.A. Alberdingk Thijm was a cousin of his mother. His youngest son Karel wrote under the pseudonym Lodewijk van Deyssel. 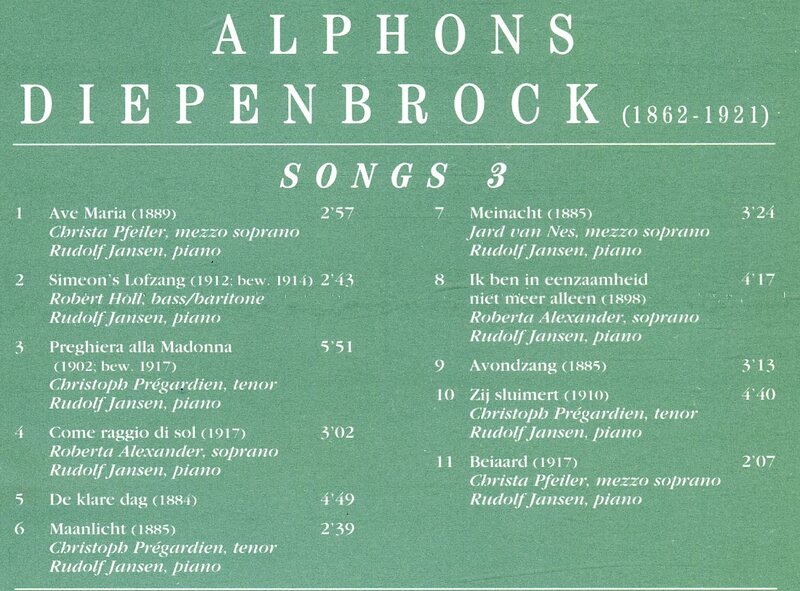 Within Diepenbrock’s oeuvre this composition is unique in character: while the basic tempo of most of his songs is calm, this is the only work in Allegro molto combined with the direction heftig (vehement). The staccato chord repetitions in fast quaver triplets, which pound on for almost three quarters of the total number of measures, evoke a feeling of nervous excitement. The work was composed in a single day (13 February). Four days later (17 February) it was given a somewhat longer finale in which the tension is reduced more gradually. In programme notes Diepenbrock said about the setup of the song that it is constructed from two motives. The second appears in the second quatrain and depicts the appearance of the beloved in the distance. The first initially only occurs in the introduction and the short interludes, until in the third line of the first tercet the voice takes up the motive in f minor, the melody in the bass depicting the moaning of the wind. The vehement triplet motive from the beginning gradually gets softer until, in the epilogue, it fades away pp in the low register. 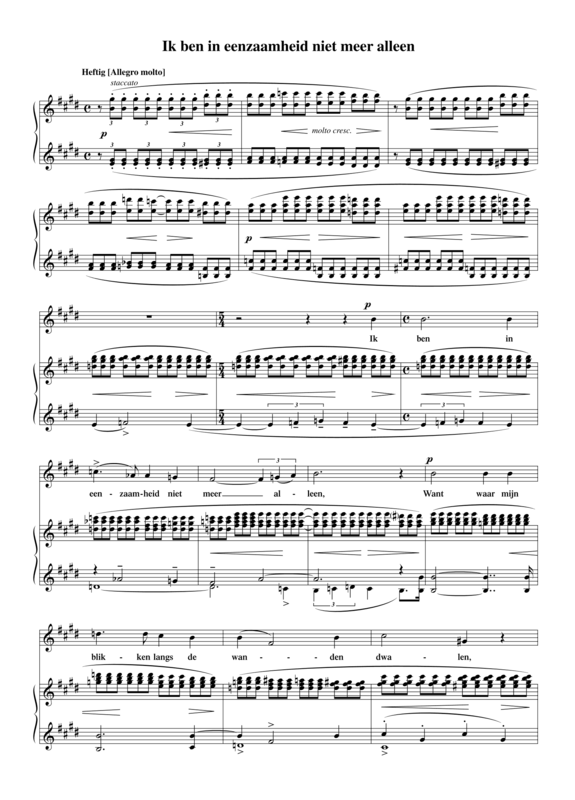 (BD V:703) Diepenbrock dedicated this song to Charles Smulders, the first professional musician to show an interest in Diepenbrock’s works at a time he felt isolated as a composer. In the printed edition of 1905, for soprano or tenor and piano, a German translation by F. du Pré (trombonist in the Concertgebouw Orchestra and music copyist), which was authorised by Diepenbrock, has been placed underneath the Dutch text of the vocal part. The work was orchestrated in 1906 (see RC 73).